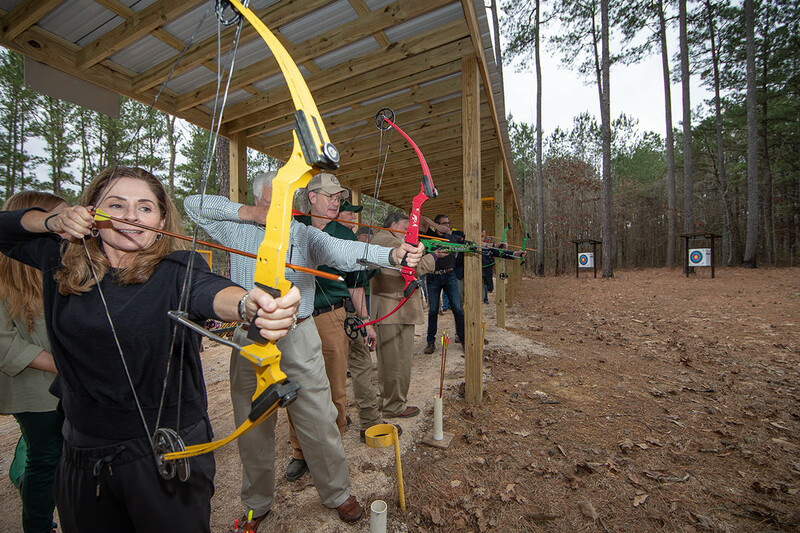 Alabama’s sixteenth community archery park held its grand opening on Wednesday, February 6, 2019, at Walker County Public Fishing Lake near Jasper, Ala. The archery park is located at 4227 Walker County Lake Rd., Jasper, Ala., 35501. The archery park will be open during the lake’s operational hours for recreational shooting, competitive tournaments and outdoor educational programming. The facility features an eight-target adult range from 15 to 50 yards and a four-target youth range of 5 to 20 yards. Additionally, Walker County is the first state-operated archery park in the nation with a wheelchair-accessible elevated shooting platform. The elevated platform has six targets at distances ranging from 10 to 40 yards. Use of the archery park is free for those under 16 years of age or over 65. Alabamians ages 16 to 64 must have a hunting license, Wildlife Management Area (WMA) license, or Wildlife Heritage license to use the range. For non-residents, an annual WMA license or non-resident hunting license is required. Licenses are available from various local retailers or online at outdooralabama.com. Walker County joins 15 other community archery parks currently in operation throughout the state including Athens, Cullman, Dothan, Demopolis, Decatur, Elba, Foley, Heflin, Huntsville, Lincoln, Tuscaloosa, Ozark, Wetumpka, and in Oak Mountain and Wind Creek state parks. 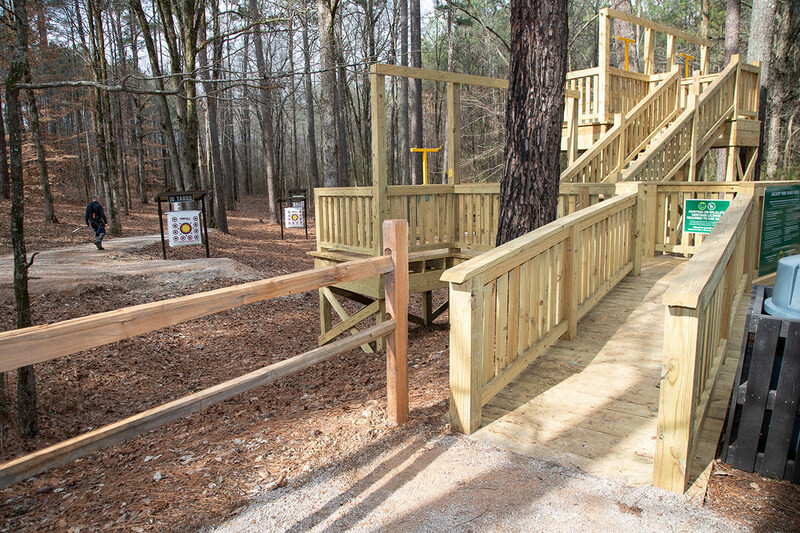 These facilities are one component of the Alabama Department of Conservation and Natural Resources’ (ADCNR) effort to increase awareness and participation in the life skill of archery. The new archery park was made possible by the following agencies and organizations: The City of Jasper, Walker County Commission, Walker Area Community Foundation, Health Action Partnership of Walker County, the Archery Trade Association, Alabama Cooperative Extension System, Alabama Forestry Commission, Boy Scouts of America – Black Warrior Council, McGeHee Engineering, United Way of Central Alabama, Vulcan Materials, and ADCNR’s Division of Wildlife and Freshwater Fisheries with funding through hunting license sales and federally matched Pittman-Robertson Act funding. For more information about Alabama’s community archery parks, visit www.outdooralabama.com/activities/archery-parks. For more information about Walker County Public Fishing Lake, call 205-221-1801. The Alabama Department of Conservation and Natural Resources promotes wise stewardship, management and enjoyment of Alabama’s natural resources through four divisions: Marine Resources, State Lands, State Parks, and Wildlife and Freshwater Fisheries. To learn more about ADCNR, visitwww.outdooralabama.com. First arrows fly at the Walker County Community Archery Park on Wednesday, February 6, 2019 --Photo by Billy Pope, ADCNR.